Fuhu Inc. and Intel collaborated to deliver the best technology for DreamTab, the new powerful educational and entertainment tablet for kids. Powered by the latest Intel® Atom™ processor (Bay Trail), the DreamTab Android* tablet is expected to be available globally in June. The DreamTab will feature an exclusive Creative Studio “Be an Artist” animation program to help kids create their favorite animated DreamWorks* character. 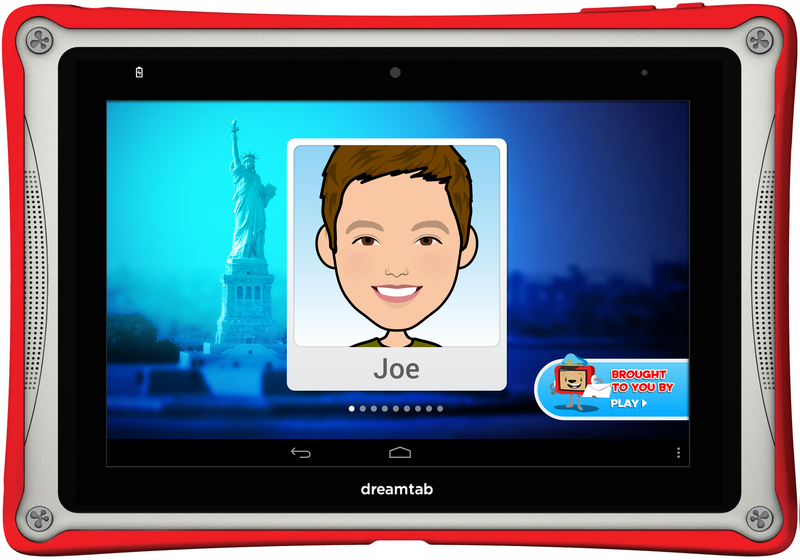 EL SEGUNDO, Calif., and SANTA CLARA, Calif., Jan. 7, 2014 – Fuhu Inc., known for creating cutting-edge tablets and applications for children, today announced the new DreamTab tablet. Designed to deliver grown-up technology but built just for kids, the tablet is the result of collaboration between Fuhu, DreamWorks Animation SKG Inc.* and Intel Corporation and is designed to deliver fun educational and entertainment experiences that transform the way kids learn, play and grow through technology. The new tablets will be available starting in June. Based on Intel’s new 64-bit enabled Intel® Atom™ Z3740 processor (“Bay Trail“), the DreamTab will offer lightning-fast performance, powerful graphics capabilities, long battery life, and rich, immersive educational and entertainment experiences. Combined with a new operating system layer on Android*, it will be a powerful Android-based tablet that includes advances in stylus, touch-screen and NFC technologies. The DreamTab will include Fuhu’s signature Wings Learning System™ solution and a new feature, the interactive Creative Studio “Be an Artist” program, built exclusively for the DreamTab. Kids will be able to create their favorite DreamWorks characters in an interactive workshop featuring cutting-edge integrated animation tools. Wings Learning System™ will also work in conjunction with first-of-its-kind offline Bluetooth*-enabled workbooks, bringing together offline and online learning experiences. Advanced parental controls allow moms/dads to set time limits, add nabi coins to a kid’s account, and lock or unlock features. The controls also provide for a COPPA-compliant/kid-safe e-mail, text and photo sharing capability that is one-of-a-kind and can integrate with parents’ own mobile devices. With all-new content created for the DreamTab by DreamWorks acclaimed filmmakers to bring these innovative controls to life, kids can now customize their own tablet experience from sign on to shut down with exclusive character moments encouraging them to study, go out and play, or wake up in the morning. With NFC (near field communication) gaming technology, figurines come to life online by tapping on the tablet. The initial game, School of Dragons, an educational multiplayer online experience, will feature DreamWorks Animation’s How to Train Your Dragon franchise. Custom-built “nabi Play” features the widest variety of kids programming – from DreamWorks Animation as well as Nick*, Disney*, Cartoon Network* and other leading children’s content sources – comingled in one easy-to-navigate location. Curated App Zone and Treasure Box allow parents and kids to browse, download, purchase apps, games, music, movies, videos, e-books and even real goods with a single click. Intel believes technology can help educators, leaders and school technology professionals prepare students for a lifetime of success. Based on a decade of real-world collaboration, implementation and research, Intel education solutions are designed to help educators inspire students, to support schools in achieving educational excellence, and to enable better manageability by administrators. Intel delivers holistic solutions, including hardware, software, content, infrastructure and professional development, to help educators engage students in learning and to enhance student achievement. The Intel Atom Z3000 Processor series delivers leading performance with long battery life. It is Intel’s most capable, best-performing platform for its tablets and other sleek mobile devices. It offers a smaller footprint and lower power usage, while also enabling double the compute performance1 and triple the graphics performance2 compared to the previous-generation Intel Atom processor. It also includes Intel® Burst Technology 2.0 with four cores, four threads and 2MB L2 cache. This performance allows people to multi-task, consume and create content, and enjoy a rich experience across on their Android device. Fuhu, Inc., the creator of the nabi tablet, is the leading designer, seller and innovator of thoughtful consumer products and services for children. Fuhu is committed to creating children’s solutions that are: (1) socially responsible, (2) made right, (3) make a difference in people’s lives, (4) For Parents. By Parents.® and (5) dedicated to the intellectual development of children. Fuhu, Inc. is the No. 1 Fastest-Growing Private Company amongst 5,000 in America as ranked by Inc.’s exclusive 32nd Inc. 500|5000 list. Fuhu is headquartered in El Segundo, Calif., with offices in Denver, San Jose, China, Hong Kong, Taipei and Japan. For more information, visit www.fuhu.com and www.nabitablet.com. Any codenames featured are used internally within Intel to identify products that are in development and not yet publicly announced for release. Customers, licensees and other third parties are not authorized by Intel to use codenames in advertising, promotion or marketing of any product or services and any such use of Intel’s internal codenames is at the sole risk of the user. All products, dates and figures specified are preliminary based on current expectations, and are subject to change without notice. Intel may make changes to specifications and product descriptions at any time, without notice.